Unless you have had your head buried in the pebbles for the last few weeks, you will know that the Jubilee Library has finally opened in the North Laine area of Brighton after a wait of over 30 years. Builders Rok began construction in May 2003 and completed on schedule in November 2004. The £14.5 million library opened on 3rd March 2005: World Book Day. Brighton Library began as a reference library in the Royal Pavilion in 1866 and opened to the public in 1873 after a donation of 12,000 volumes from the Royal Literary and Scientific Institute. The Rare Books and Special Collections section in the new library houses 45,000 items alone at a value of over £5 million! In December 2000, Brighton & Hove City Council appointed Mill Group Ltd to regenerate the derelict 1.75 hectare city centre plot between Church Street and North Road under a £60 million PFI (Public Finance Initiative) scheme. Basically, the cost of the library was subsidised by the hotel, flats, shops and offices that are soon to follow. 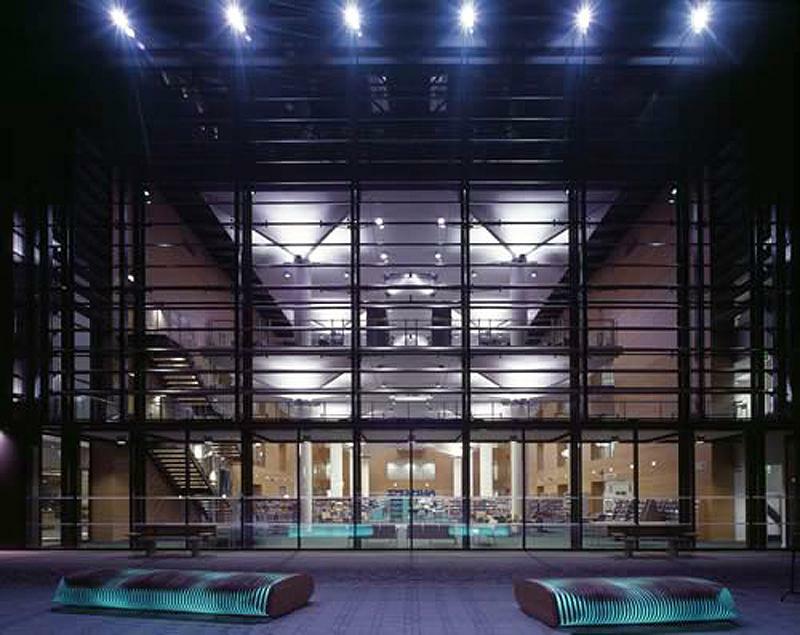 Architects Bennetts Associates and Lomax, Cassidy & Edwards designed the 5000m2 building around an extraordinarily spacious two storey hall with double height ceilings. The 256 tonne steel shell is surrounded by a tinted glass exterior. Greens will love the many great environmental features such as the toilets that are flushed with rainwater. Natural ventilation is used instead of air conditioning, linking in with the prominent wind tower features on the roof. I found it rather hard to concentrate on the official talks at the launch so I sneaked away to carry out my own investigations. I am particularly fond of the 6,346 hand-made external tiles that are a modern take on the ‘mathematical tiles’ of Brighton buildings such as Royal Crescent in Kemp Town. My only criticism is that the building is not physically detached from the surrounding development. The re-establishment of Jubilee Street and a new courtyard probably make up for this. Unsurprisingly, various teething problems with the projection screens, lighting, opening hours and computers have been reported. Minor niggles are easily fixed though. However, they do stock my column, so naturally I’m won over! Around 14,500 man days were devoted to the actual building process. This means that if just one man had been employed when the project was first conceived over 30 years ago, he would be finishing sometime around now!